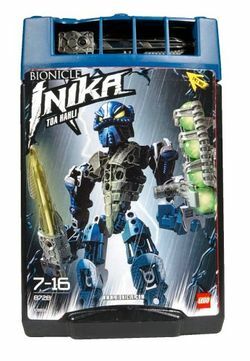 8728 Toa Hahli is a BIONICLE set released in 2006. She is one of the six Toa Inika. She is armed with a Laser Harpoon and a Zamor Sphere launcher. She wears the Mask of Detection. In the BIONICLE storyline, she was a Toa of Water. It is Hahli's second appearance in a set. She was transformed into a Toa by a bolt of lightning from the Red Star. This is a description taken from LEGO.com. Please do not modify it. (see an archive of the product's page) Seeker of the Mask of Life! Toa Inika Hahli may be the most important of the new heroes, for her Kanohi Elda, the Mask of Detection, will lead the group right to the Mask of Life! If the Piraka try to get in the way, her laser harpoon fires a mix of water and lightning. Energy harpoon lights up with a strobe effect! She is one of the rare characters with multi-color pieces. Pushing a button on her sword will cause it to light up. Facts about "8728 Toa Hahli"
Seeker of the Mask of Life!